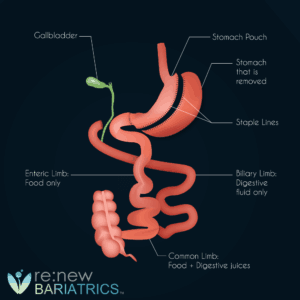 Discover the cost of weight loss surgery from Renew Bariatrics’ annual cost survey. Prices are accurate in 2019. Weight loss surgery without insurance is quite expensive, and bariatric surgery costs vary depending on the type of procedure you’re having, hospital or facility, the bariatric physician, and even the city you’re based at. * Updated in March 2019. Prices originially pulled from 8/17 from various online sources (clinics, online aggregators) reporting prices. Are you interested in undergoing Weight Loss Surgery in México? Get a Free Consultation with our staff today. Renew Bariatrics established partnerships with leading bariatric specialists in Mexico, slashing prices in the meantime. The ending result is a tremendous all-inclusive self-pay package at an affordable rate. Renew Bariatric never compromises with the quality of the packages, which is why sometimes we’re more expensive than other providers. All Packages Include medical tourism coverage is included with each package. Some bariatrics companies which provide this service, admit that your coverage stops once you travel back to your home. All of our packages include this, which is why we’re one of the best medical tourism companies in Mexico. Learn more about booking surgery today with a small credit card deposit, by calling (844) 736-3963. Please contact us today to learn more about paying your deposit with an HSA or FSA credit card. Some bariatric companies claim they have an all-inclusive price, but fail to be transparent on the hidden fees for components that should be included like take-home medication, transportation, or even having a companion. Learn more about Financing Your Weight Loss Surgery in Mexico, with financing loan companies specializing in medical tourism. Gastric sleeve surgery is covered by insurance if your plan includes bariatric surgery. The total cost on average in the US is about $19,000. Items such as pre-op testing, however, are not covered by your insurance plan. Out-of-pocket costs may be tax deductible, and self-pay patients usually have access to exclusive discounts. Within two years, gastric sleeve surgery pays for itself because of savings per year post-surgery amount to $11,000 which would have been otherwise incurred if the patient had remained obese. Renew Bariatric offers gastric sleeve start at $3,899 – all inclusive which is roughly an 80% discount from the price in the United States. Learn more: Gastric Sleeve Cost in Mexico. Gastric sleeve surgery involves reducing the stomach size by 80% so that the patient eats less and feels full sooner. 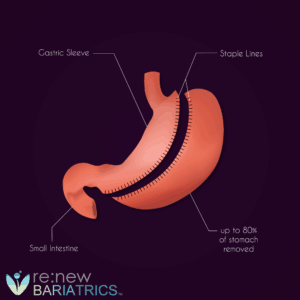 The gastric sleeve procedure involves reducing the size of the stomach using staples to create a sleeve-shaped stomach which is typically the size of a banana. The surgeon makes small incisions instead of one large incision and observes his progress via a small camera inserted with a viewing tube. With this new size, the portion of food one eats is severely limited – one can only hold about a cup of food which helps an individual to limit what one eats because they fill up very quickly. While the amount of food consumed is physically limited, digestion and absorption remain reasonable. 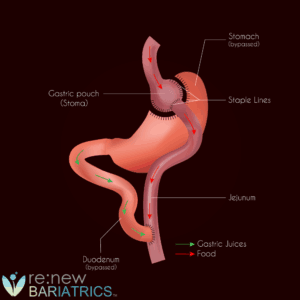 In some cases, gastric sleeve surgery is a pre-requisite to duodenal switch or gastric bypass surgery. This is known as a staged approach to weight loss surgery because the first procedure results in weight loss which makes the second process less risky. The second operation can occur 6 to 18 months after the first procedure depending on how much weight has been lost. Candidates who qualify have a BMI of 40 or more and have a severe obesity-related health complication such as Type 2 diabetes, high cholesterol, sleep apnea or high blood pressure. You are also required to have completed a medically supervised diet program. Most patients stay in the hospital for 2 to 3 days for initial healing and require at least two weeks off from work. Full recovery takes about six weeks. Gastric bypass surgery, otherwise known as the quintessential weight-loss surgery, is covered by insurance, Medicare, and Medicaid. The cost of the procedure in the United States typically costs between $25,000 to $30,000. Renew Bariatrics provides affordable gastric bypass in Mexico, starting at $6,300 all-inclusive which includes medical tourism insurance. The package will typically range in Mexico from $5,500 to $9,000 depending on which location in Mexico, surgeon, company, and other factors. Gastric bypass surgery, otherwise called roux-en-y gastric sleeve surgery, is a weight-loss surgery that uses two techniques to achieve considerable weight-loss: restrictive and malabsorptive techniques. Gastric bypass has similar expected weight loss, with both gastric sleeve surgery and duodenal switch. The total average cost of the procedure averages $8,150 before tax savings and financing. It is FDA-approved but is not typically covered by insurance, Medicare or Medicaid. In France, the procedure costs on average 3,000 Euros. Gastric Balloon in Mexico will typically cost roughly USD 4,000 including the cost of removal six or twelve months later. Gastric balloon is a weight loss procedure that involves inserting a flexible deflated silicon balloon into the stomach through the mouth which is then filled with air or liquid. This procedure reduces the amount of food a patient eats because they fill up faster. This procedure is reversible, and the silicon balloon can be left in the stomach up to six months. Once it is removed, the stomach, and often, the patient’s appetite returns to normal. This procedure takes about 20 to 30 minutes to perform and is done under general anesthesia or sedation. Overnight hospital stay is not usually required though some doctors prefer the patient to stay one day/night in the hospital for observation. Typically, you can go home three to four hours after the balloon is inserted and inflated. An anesthesia spray numbs your throat for easier insertion of the deflated balloon using endoscopic instruments attached to a camera for the surgeon to see the area. A catheter is connected to the balloon which the doctor fills with air or a saline solution and then removes the catheter. The balloon seals itself automatically with a self-sealing valve and floats inside the stomach. Once full, the balloon is too big to pass into the bowel. 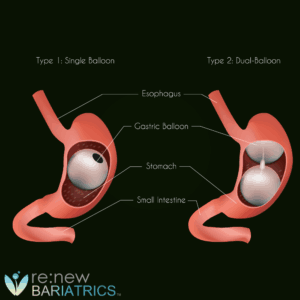 The gastric balloon is typically kept in the stomach for about six months and then is removed. Once removed, your stomach returns to its normal size. The theory behind this procedure is that when you had the gastric balloon in your stomach, you got used to eating smaller portions. Even with the gastric balloon removed, it is expected that your brain is now conditioned to keep eating smaller portions of food and thus maintaining an ongoing and long term weight loss lifestyle. In Canada, the average cost is CAD 17,575 while in Australia its AUD 17,700. In the United Kingdom, the average price stands at £4,995. Medical travel (International) ranges from $4,000 to $15,000. The average cost of gastric banding in the US is $15,000, but this does not typically include pre-op, post-op, special circumstances or complications arising post surgery. This cost also varies from one location to another. Different surgeons within the same city also tend to have a price difference ranging from $5,000 to over $10,000. In Mexico, Gastric Banding (Lap-Band or REALIZE Banding System) cost will typically be $5,000 to $7,000 – but the number of providers offering the surgery are shrinking considerably. The efficacy, or expected weight loss is so poor, most bariatric surgeons Worldwide are opting and preferring gastric sleeve surgery. 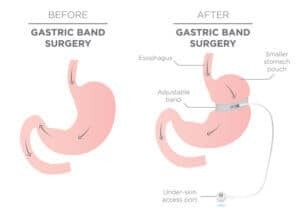 Gastric banding is a type of restrictive weight loss surgery where a silicone band having an inflatable inner collar is placed around the upper stomach to limit food intake. A narrow passage and a small pouch are created whereby the narrow passage delays depositing of food in the pouch. This gives a feeling of fullness in a much shorter time. The banding can be adjusted over time to alter the size of the passage. A small port is placed in the abdominal wall, and the silicone band is connected to it. The diameter of the band is adjusted by filling the port with a saline solution. Depending on your food cravings, weight loss and any physical post-surgery reactions, your surgeon can make periodic adjustments. The procedure is usually done by making small incisions instead of one big incision, and a catheter with a tiny camera is inserted to help the surgeon view the progress of the surgery. The surgery takes about 1 – 1.5 hours either on an outpatient basis or a one-day hospital stay. This procedure is ideal for candidates who have a BMI greater than 40, i.e., 100 pounds overweight in men and 80 pounds overweight in women. It is also a better option for patients for whom gastric bypass is too risky due to inherent health complications. Duodenal Switch is covered by insurance in the United States if your policy includes bariatric surgery. In Canada, several provinces but not all cover this procedure, however, wait times are long ranging from 2 to over ten years. In Australia, Medicare and private insurance cover a portion of the total cost. The total cost of the procedure in the US averages $27,300. In Canada and Australia, the procedure is not widespread, so an average cost is not available. In India, the procedure costs $14,000. Also, subsequent costs of bariatric supplements and vitamins cost about $1,500 per year or more through medical expenses for patients’ post-Duodenal Switch surgery are far less than pre-surgery. In Mexico, the average price is $8,000, but you have to pay extra attention to the surgeons’ experience and capability. Since Duodenal Switch is a complicated procedure, there isn’t a single doctor with 1,000s of surgeries under their belt. Duodenal Switch is a complicated weight loss surgery that combines two surgical techniques, i.e., restrictive and malabsorptive. The restrictive component involves dividing the stomach vertically and removing at least 85% of it to leave a banana-shaped pouch. The sections of the stomach that are kept intact include the pyloric valve which is essential for the regulation of stomach contents released into the small intestines. Another section which remains intact is the duodenum which is located in the digestive system. It is located between the stomach and the middle intestine and allows food that has mixed with stomach acid to move into the duodenum where it mixes with bile and digestive juices from the gall bladder and pancreas respectively. The malabsorptive component restricts some nutrients and calories that the body absorbs. It involves the rearrangement of the small intestine to separate the flow of bile and pancreatic juices from the flow of food. Therefore, food only interacts with the digestive juices in the latter section of the small intestine, i.e., about 18 to 24 inches only. This, therefore, means that you consume less food than usual though not as less as other weight loss surgeries but also, there is also a limited amount of food that is digested and absorbed in the body.